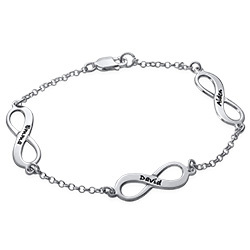 Our infinity jewelry line is among our most popular styles. If you have an unending amount of love for more than one person, we have the perfect way for you to show the world. Our Gold Plated Multiple Names Infinity Bracelet can include up to four infinity charms, and each one can be engraved with the name of someone who is important to you. The infinity symbols are perfectly placed on a gold plated Rollo chain. Treat yourself to this bracelet or gift it to a woman in your life.